In Svalbard, the snow melts to reveal a mysterious honeycomb network of irregular shapes (fig. 1). These shapes may look as though they have been created by a rogue baker with an unusual set of biscuit cutters, but they are in fact distinctive permafrost landforms known as ice-wedge polygons, and they play an important role in the global climate. In winter, cracks form when plummeting air temperatures cause the ground to cool and contract. O’Neill and Christiansen (2018) used miniature accelerometers to detect this cracking, and found that it causes tiny earthquakes, with large magnitude accelerations (from 5 g to at least 100 g (where g = normal gravity)!). Water fills the cracks when snow melts. When the temperature drops, the water refreezes and expands, widening the cracks. Over successive winters, the low tensile strength of the ice compared to the surrounding sediment means that cracking tends to reoccur in the ice. As the cycle of cracking, infilling, and refreezing continues over centuries to millennia, ice wedges develop. Subsurface ice wedge growth causes small changes in the ground surface microtopography. There are linear depressions, known as troughs, above the ice wedges (fig. 2). Adjacent to the troughs, the soil is pushed up into raised rims. From these raised rims, the elevation drops off into the polygon centre, forming low-centred polygons (fig. 2a). 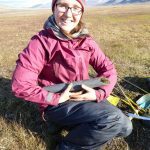 Permafrost in the Northern hemisphere is warming due to increasing air temperatures (Romanovsky et al. (2010). As air temperatures rise, the active layer (the ground that thaws each summer and refreezes in winter) deepens. 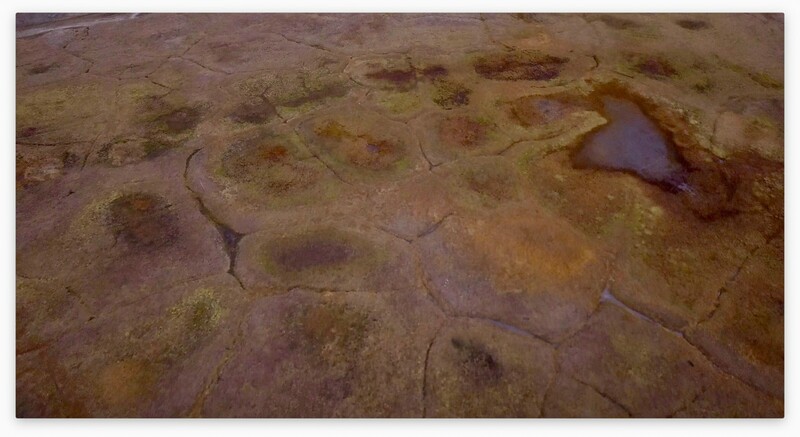 As permafrost with a high ice content thaws out, the ice melts and the ground subsides. On the other hand, permafrost containing no ice does not experience subsidence. Consequently, permafrost thaw can cause differential subsidence in ice-wedge polygon networks. 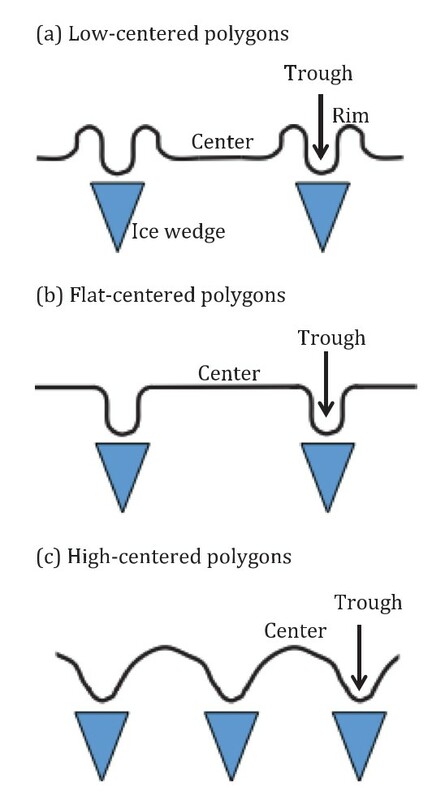 This re-arranges the surface microtopography: ice wedges melt, the rims collapse into the troughs, and the polygons become flat-centred and then eventually high-centred (fig. 2b and c; Lara et al. (2015)). Wedge ice is ~20 % of the uppermost permafrost volume, and so this degradation could have a big impact on the shape of Arctic landscapes. Are ice wedge polygons climate amplifiers? Fig. 2: Schematic diagrams of polygon types and features [Credit: Wainwright et al. (2015)]. 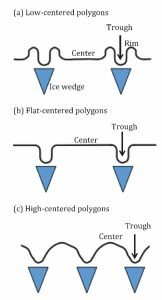 The transition from low-centred to high-centred ice-wedge polygons affects water distribution across the polygonal ground. The rims of low-centred polygons tend to block water drainage, whereas the troughs facilitate relatively fast and effective drainage of water from the polygonal networks (Liljedahl et al., 2012). So, during summer, the centres of low-centred polygons are frequently flooded with stagnant water, whereas the central mounds of high centred polygons are well drained (and good to sit on at lunchtime!). The contrast in hydrology influences vegetation, surface energy transfer, and biogeochemistry, in turn influencing carbon cycling and the release of greenhouse gases into the atmosphere. High-centred polygons can have increased carbon dioxide emissions compared to low-centred polygons, on account of their lower soil moisture, reduced cover of green vascular vegetation and the well-drained soil (Wainwright et al., 2015). On the other hand, once plant growth during peak growing season is accounted for, this can actually cause a net drawdown of carbon dioxide in high-centred polygons (Lara et al., 2015). In contrast, there is general agreement that low-centred polygons are associated with high summer methane flux (Lara et al., 2015; Sachs et al., 2010; Wainwright et al., 2015). This is due to multiple interacting environmental factors. Firstly, low centred polygons have a higher temperature, which increases methane production rates. Secondly, they also have moister soil, which decreases the consumption of methane, owing to the lower oxygen availability. Thirdly, the low-centred polygons often have more vascular plants that help transport the methane away from its production site and up into the atmosphere. Lastly, the low-centred polygons had higher concentrations of aqueous total organic carbon, which provides a good food source for methanogens. As the climate warms, ice wedge polygons will increasingly degrade. The challenge now is to figure out whether the transition from low-centred to high-centred polygons will enhance or mitigate climate warming. This depends on the balance between the uptake and release of methane and carbon dioxide, as well as the rate of transition from high- to low-centred polygons. Liljedahl, A.K., et al. (2016), Pan-Arctic ice-wedge degradation in warming permafrost and its influence on tundra hydrology. Nature Geoscience, 9, 312-316. Wainwright, H.M., et al. 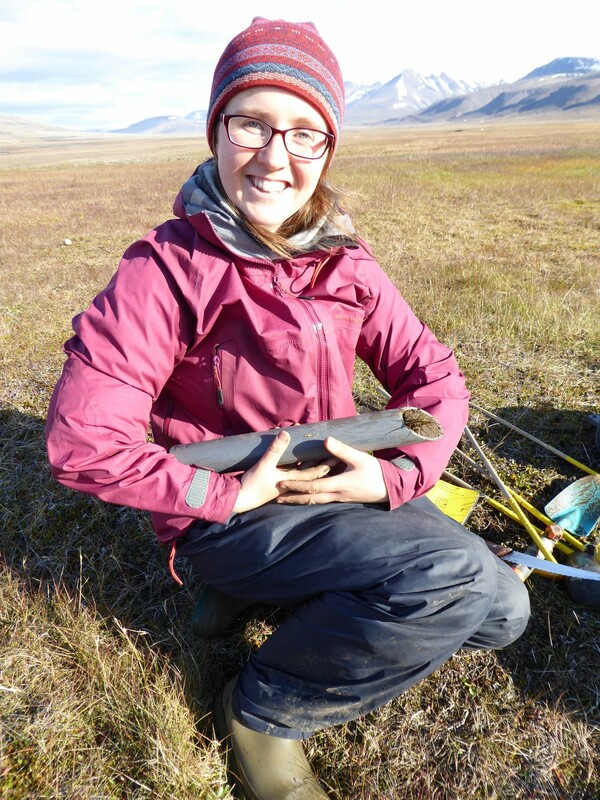 (2015), Identifying multiscale zonation and assessing the relative importance of polygons geomorphology on carbon fluxes in an Arctic tundra ecosystem. 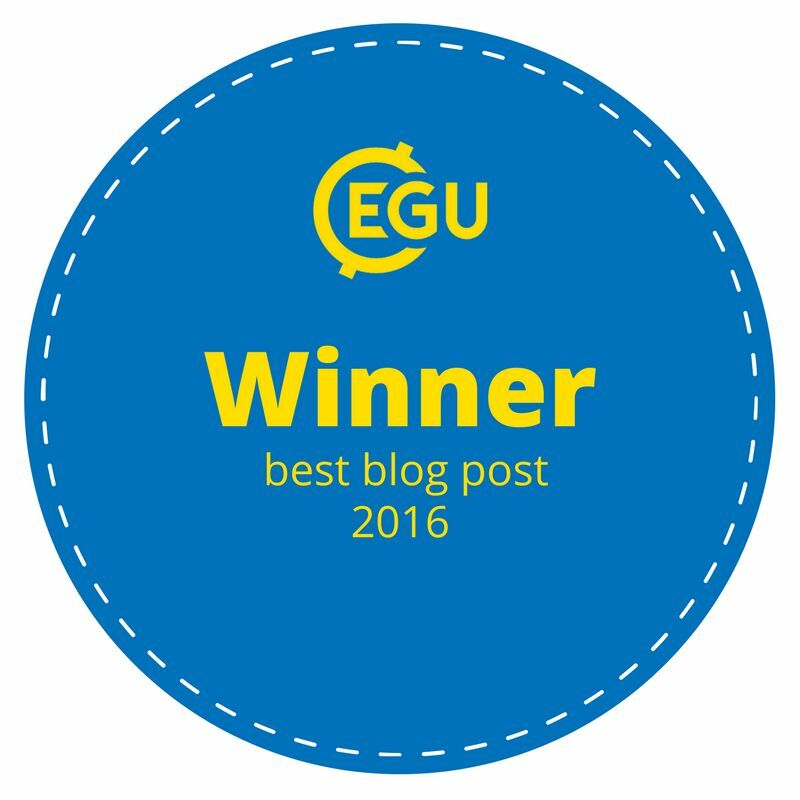 Journal of Geophysical Research: Biogeosciences, 707-723. Image of the Week – Mushrooms at zero degrees = hair ice?! Image of the Week — Where do people stay in the “coolest” place on earth?